Jo Ann and Mickey- a pretty good lookin’ pair. I met Jo Ann when about five years ago when Jordyn was two. I had gotten talked into helping out announcing at a horse show and if I did, they would find little Jordyn a horse to ride in the leadline class. So one of Jordyn’s first horse show experiences was with Jo Ann’s then 27 year old, black, OTTB named Hershey. He was perfect for her. Later when Jo Ann was looking for a place to board her old man, Hershey (then 31) and her superstar Quest, our vet Lynn, recommended our place to Jo Ann. It has been a good fit. Due to a series of adventures, good and bad, Jo Ann has been left without a regular horse to ride, Hershey was saddly too old and Quest moved on to greener pastures. 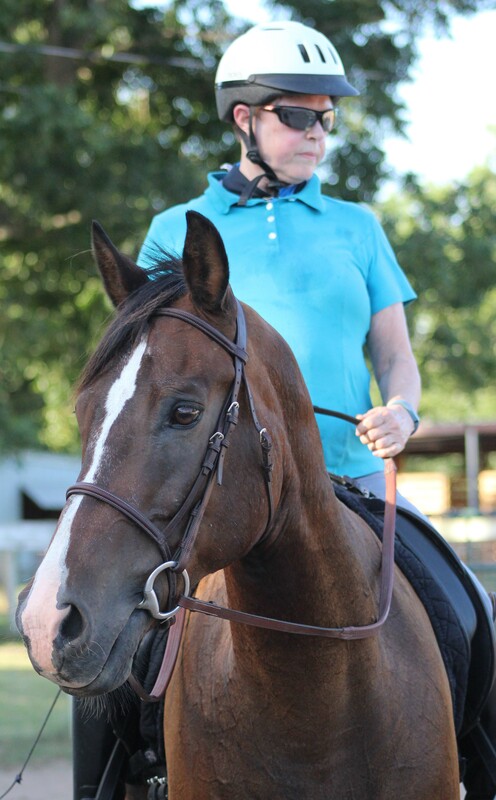 She came back to riding dressage with Nancy Lindsey and my go-to pony, Snowboy. Not to give out state secrets, but Jo Ann is older than I am by a few years. And we all know I am really old. Jo Ann and I have had some serious run-ins with medical professionals but while mine have been orthopedic hers have been some fairly critical medical issues. In fact it seems a little more than a month ago Jo Ann had some pretty important surgery. I am a fairly competitive person. That may be an understatement. I used to be a competitive horsewoman and spent my childhood in lessons and shows. By the time I started college, I was pretty done with all that. I rode because I enjoyed riding. I did some shows off and on through the years but usually to prove I could or to help Ally or Lauren out by riding their show horse prior to them riding. 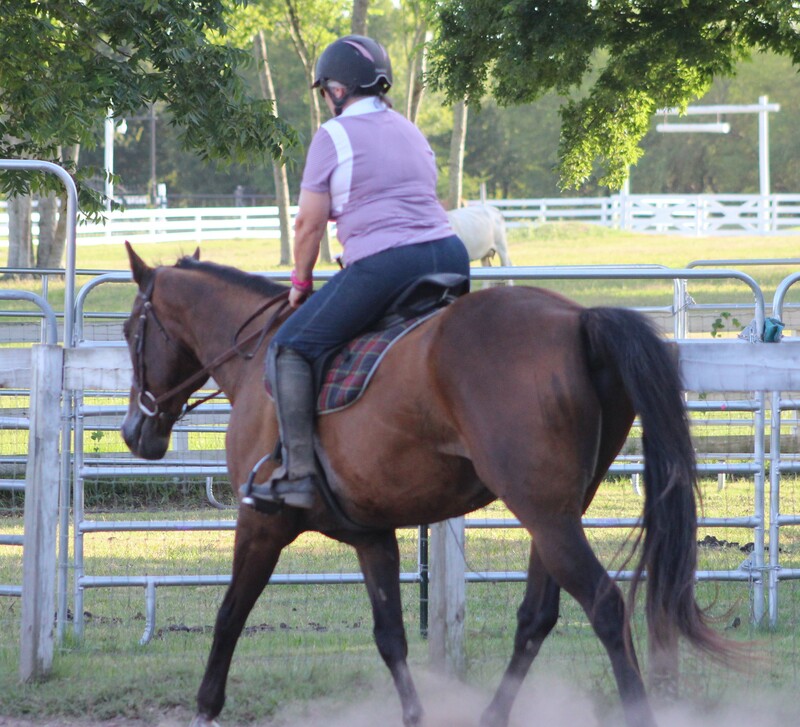 I have been watching Jo Ann as she has continued to ride, in spite of not having a horse right now, in spite of the heat, in spite of her medical issues and had a little “A HA” moment. Jo Ann has worked her way up to riding Lauren’s jumper, Mickey. There is something dynamic and exciting about watching this cow-bred Paint, excel at something else he was not bred to do. He was never bred to jump and he has soared. 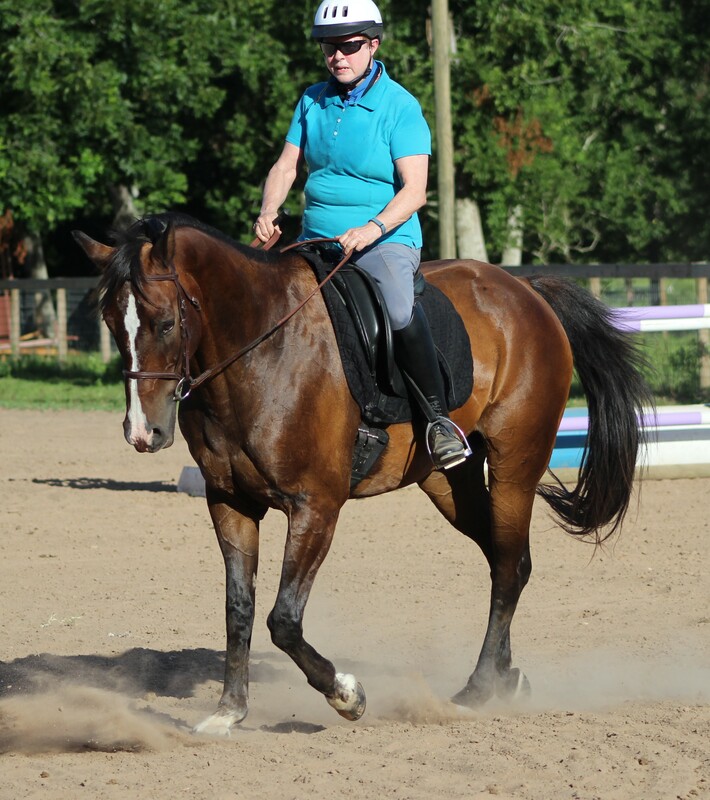 He was never bred to bend and float and now Jo Ann has him doing dressage. What a special guy he is! I have been riding my new horse Nova pretty consistently and wanted to take a lesson with Dev once I got her going pretty well. Of course, part of it was me-the getting going part. Coming back from the hip replacement surgery and my nine other orthopedic surgeries in this decade have made my muscle tone and strength not what they were. So, that was a good excuse as well. I had told Dev that I would do a lesson this last weekend, but wouldn’t you know it-Nova came up lame. Reason enough to put that off until she was better. Mickey and I doing just fine. Sunday, for the first time in 40 years, seriously, 40 years, I took a horseback riding lesson. And I did just fine. And I did it on Mickey. Who did his best for me (at least mostly). So, what is the big deal? For 40 years, I have been content to listen to other riders, to read books and articles about riding, to watch clinicians and videos but I have not be willing to put myself out there where the focus as direct and on me-specifically. I had watched my friend Jo Ann take lessons. Honestly, at first I really thought she probably couldn’t ride that well, I mean she was old like me. 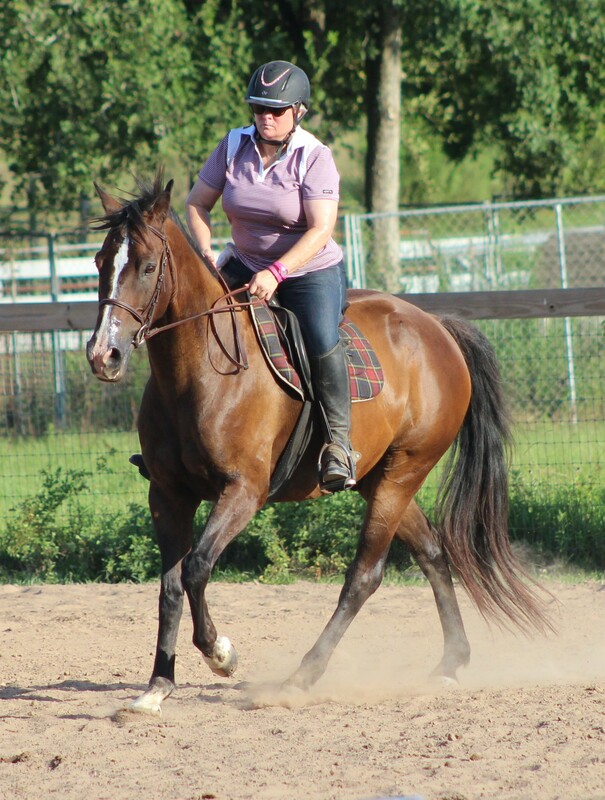 But then I watched her turn in better and better rides on a variety horses and I had learned that if I wanted to get better and get serious, I had to learn more. We never quit learning or getting better. Sometimes we have to be brave enough to face the criticism that may occur when we step out into something new. 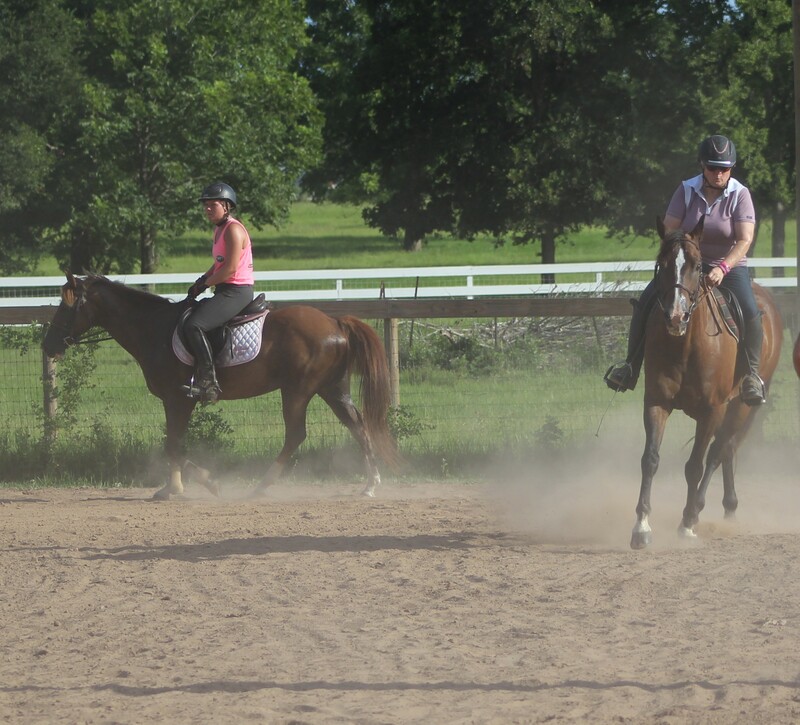 I did not even get criticized during my lesson (George Morris was not available for a crtique). Instead I got nice words about my position and quiet hands along with suggestions for doing things even better. And to you- Jo Ann-Thank you for the inspiration. You will see in these videos what a lovely rider you are. Bravo to you, for hanging on and moving forward. I believe you showed these kids around here a few things as well. As John Wayne reportedly said, “Courage is being scared to death and climbing up into the saddle anyway”. I am glad I climbed up in the saddle again to learn. Lauren and I taking a lesson together-first time ever. She is on Owen.